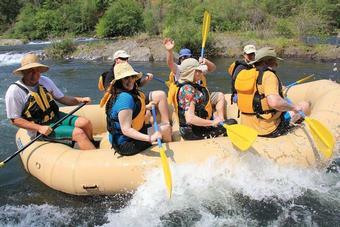 Beyond Limits Adventure's 1 day rafting trip on California's South Fork American River is the top 1 day rafting adventure in the West! You won’t want to miss the outstanding intermediate level class 3+ rapids which are numerous in the lower gorge section. The river corridor is surrounded by wilderness scenery and the crystal clear water flows high all summer long! All Beyond Limits 1 day trips on the South Fork American River begin at River Park Resort which is the nicest rafting facility on the American River. We provide freshly prepared lunches every day and our modern rafting gear is cleaned and dried after every trip. Restrooms and showers are available to all trip participants. After your trip be sure to check out your GoPro Video and photos which are taken of your raft throughout our 1 day trip. We also serve cold draft beer, wine and non alcoholic beverages during our daily happy hour when you arrive back to River Park Resort. Saturday and Sunday 1-Day trips check-in at 10:00AM. Monday through Friday 1-Day trips check in at 11:00AM. Trip duration is usually 6 hours. Once all guests have arrived, your group will be given an orientation by our trip leader in the meeting area. Safety techniques and helpful hints are the main topics to be discussed. After the "safety talk" we will suit you up with your pfds (personal flotation devices) and hand out a paddle to each participant. Your raft will depart from our private riverfront resort. 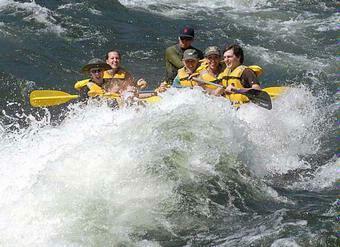 We will raft through a nice section of class 2 and 3 rapids known as the "Lotus Section". After the Lotus section we will enter a wilderness section with beautiful riparian scenery. Keep your eyes open for trout, otters, wild turkeys and white-tailed deer as we ride the rapids in this wonderful setting. 1:00PM - A deli-style lunch is served on river. If you are a vegetarian please mention this at time of reservation. 2:00PM - Lower gorge section - Get ready for the best 7 mile section of class 3 water in the state! The lower gorge features exciting rapids like "Fowler's Rock", "Satan's Cesspool", "Haystack Canyon", and "Hospital Bar". We'll get soaked as we ride these big rapids and rest in the few pools between. 4:00 PM - Takeout at Salmon Falls bridge. Depending on the level of Folsom Lake, we might be towed across the lake for the last mile of the trip. Our shuttle bus will be waiting with a cooler full of cold refreshments when we arrive. After the gear is loaded we'll board the bus for a 30 minute ride back to camp. 4:30 PM - We arrive back in camp. Enjoy a cold beer or refreshment while you view your photos of the trip. You may purchase a CD full of great shots of your raft riding the rapids of the fabulous South Fork of the American River! Driving from Sacramento: Take highway 50 east from Sacramento to the Ponderosa Road/ Shingle Springs exit - EXIT NUMBER 37. (You will be following signs to Coloma). At the end of the ramp, turn left, and go over the highway. There are two stoplights immediately after the overpass, take a right turn at the second stop light (North Shingle Road). Take North Shingle Road approx. 4 miles until it becomes Lotus Road. Take Lotus road until it stops at highway 49, turn left. Go over bridge and turn left on River Park Dr., there is a left-hand turning lane just after the bridge. There is also a Pizza place here. Follow River Park drive to the left and into our resort. Our Resort is marked by a large brown "River Park Resort" and "Beyond Limits Adventures" sign. Driving from South shore Lake Tahoe: Take highway 50 west until Placerville. Take the highway 49 (Spring Street) exit, right, off of highway. Follow highway 49 north until you reach Coloma. At the left hand turning lane just past the highway 49 bridge over the river, turn left onto River Park Drive. There is a Pizza place here. Follow River Park Drive into our resort - River Park Resort. Please do not bring pets on the river. Beyond Limits has a dog watching service while you are rafting. Ask us for details. River Park Resort - Upgrade your trip to a 2 day trip. Camping and meals are included! 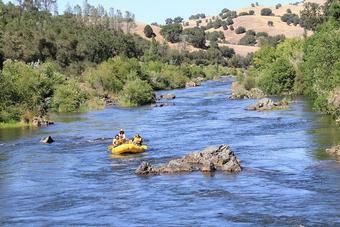 Courtyard by Marriott - Folsom Special Whitewater Rate!